Some drought we're having here in Iowa, we got two and a half inches of rain last night, which is roughly equivalent to how much water is in my basement. My landlord has promised to fix the flooding for the last 10 months, so I'm not holding my breath. My desk is relatively clean! After rearranging some systems, I finally was able to swap out my 17 inch monitor for a 15 inch LCD panel again. I can't survive without two monitors now that I'm used to it. 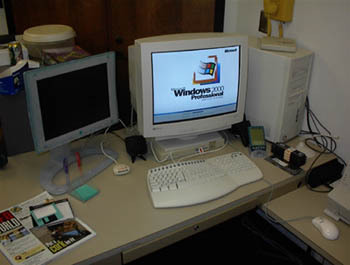 I had to clean my desk once I realized how much junk was on it, but hidden by the big CRT. I'm estimating I have about half an hour before my boss walks in and puts something on my desk that doesn't belong there.